In late July the summer sun rises early and retires late behind the western hills, dawn precedes the sun by nearly an hour and twilight lingers long after the sun has set. This is what I call 'High Summer', the peak of the summer season, that time period when all of creation seems to have reached a zenith. Clear nights allow the temperature to dip into the upper 40's, but with the coming of the dawn the red line in my thermometer rises rapidly. These are the dog days of summer with rapidly rising temperatures under the cloudless skies. By afternoon the land bubbles with the heat, heat waves rising from the land and distant objects are distorted into surreal shapes by the rising air. Set in motion the thermal winds, hot and dry, provide little relief from the heat, but soaring birds ride the uplifts until they are mere specks in the azure blue sky. In the heat of the day the only sound is the rustling of the grass, the shrill of the cicada, and the sharp click of the wings of the grasshopper. All of nature awaits the coolness of the evening. The sun hangs low over the western horizon and long shadows begin to creep across the valley floor. In the river bottom the coolness of evening begins to settle, and in the remaining hour of daylight all of the creatures that have been enduring the heat of the day begin to emerge from their places of refuge. Whitetail deer, with spotted fawns trotting at their heels, emerge from the shadows to feed. It has been a good year for deer, and each doe has a matching set of twins. The fawns run and jump, and even the does occasionally are caught up in the joy of being alive, joining their youngsters as they chase and leap about in the long grass. A young buck joins the does and fawns sporting a small set of velvet-covered antlers. At the edge of the cottonwoods a considerably larger buck, with antlers extending well beyond his ears, browses on the lush grass, but does not join the others in the open field. The riparian area is lush and green. The grass is waist high with ripening seed heads turning slightly golden. Almost absentmindly I pull a stalk of timothy, its seed head like a miniature cattail head, and stick it in my mouth, a tribute to my childhood on the farm. Chewing on the stem I walk along the stream soaking in the cool of the evening. Along the banks thick stands of large yellow coneflowers stand out in vivid contrast to the deep green of the surrounding foliage. Golden rod, a certain reminder that fall is near, is beginning to blossom under the stream side willows. In the cool of the evening all of nature seems to be attempting to catch up on all the lost hours of the day when temperatures were too hot to carry on normal activities. Swallows have fledged their young and the evening air is filled with the twittering of young birds learning to use their wings. Young red-winged blackbirds cling to willow branches, yellow warblers dart through the foliage feeding on caterpillars, leaf hoppers, and other insects. Cedar waxwings dart out over the stream fly catching. There are kingbirds on the fence wires, nighthawks patrolling over the tree tops, song sparrows still singing along the stream, wrens chattering, crows cawing, and the first flocks of grackles and starlings streaming overhead. A great blue heron flaps silently upstream, and upon seeing me uttered a startled squawk and veers off his chosen course. Squawking and grumbling he flaps away, and I think that I am fortunate that I do not understand what comments he is making. As the sun slips behind the western horizon the mountain peaks begin to glow red. Large cumulus clouds piled up along the southern end of the valley begin to suffuse with shades of mauve and rose red colors making a constantly shifting panorama as the sun slides farther below the horizon. The towering white cloud tops are almost luminescent against the darkening sky. The gusty wind that had been blowing turns to a gentle breeze, and then dies completely with the closing of the day. I take several pictures with my camera, but I know that they will fail to fully capture the beauty of this setting. All of this beauty is mirrored in the surface of the stream, and now in the gathering dusk a few caddis flies begin to dance and skate over the surface. Occasionally a mayfly drifts past, and swarms of midges suddenly appear to join the caddis flies skating on the mirrored surface of the stream. As if on cue a trout eases its nose through the surface film, sipping in a dancing midge, and creating a tiny dimple to mar the perfect reflection. Slowly at first, then with increasing rapidity other trout join in the leisurely feeding. The mirrored surface is a moving feast with a myriad of insects held fast in its tenacious film, and a small net held in its flow is quickly covered with a potpourri of tiny ants, beetles, flies, midges, and any number of other types of insects. Under the cover of twilight, trout that have spent the day buried in the undulating waterweeds emerge to take up feeding stations in the channels between the weed beds, and leisurely feed on the passing feast. 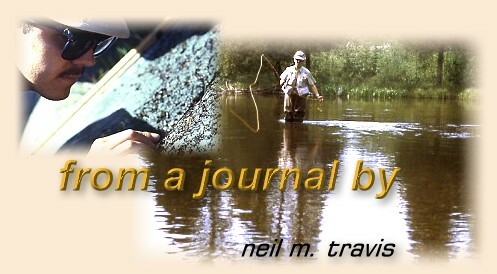 With rod in hand I ease my way into the stream, careful to avoid making a disturbance that would announce my presence, and send the feeding trout scurrying back into the weeds. Once in place I drop a tiny fly slightly upstream from the largest nose within casting range, and wait with anticipation as my offering floats over his position. He rises to a natural before my offering arrives, and I allow it to float passed his position before I lift it gently, and offer it again. Once again he rises early, and then again. Finally, on the fourth drift he takes my fly, and moments later slides over the rim of my net, a fine brown trout with my tiny fly securely in the corner of his toothy jaw. Forceps allow me to avoid those needle sharp teeth as I remove the tiny barbless fly from the gristle in the corner of his jaw. I gently hold him by the tail until he regains his balance, and with a flick he quickly scoots away. There are other trout rising to bits of minutiae, but my attention is caught and held by the beauty of the evening. The mountains, now glowing with even a greater intensity, are mirrored in the perfect reflection of the stream. In the light reflected from the billowing white clouds all of the colors are magnified, and all is held captive in the reflection of the stream. Overhead, nighthawks swoop with mouths agape gathering in the insect feast, swallows dance with grace befitting a ballerina, and all of nature is in quiet reverie beneath the shifting colors of the setting sun. I settle back on the bank to blend, and become one with the scene. The trout continue to rise until it is too dark for me to see, and a sliver of a moon hangs, as if by the slenderest of thread, in the afterglow of the setting sun. Day is spent, and bats appear to replace the creatures of the day. A great blue heron, perhaps the one I startled earlier passes overhead, so close that I can hear the creak of the pinion feathers in his wings. Good fishing, I think as he passes.